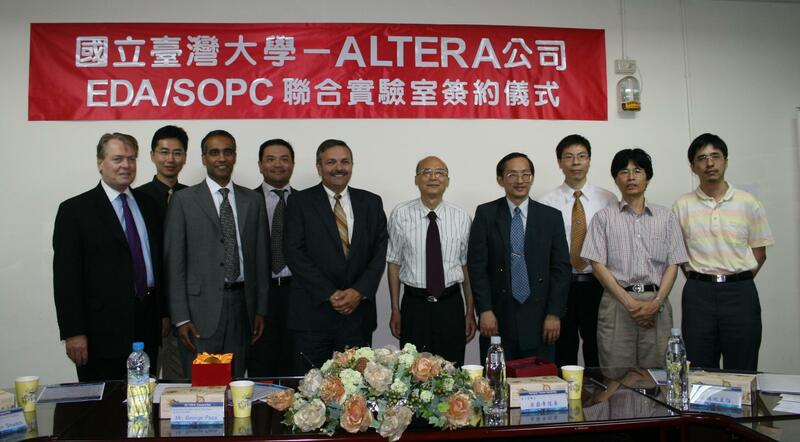 National Taiwan University and Altera® Corporation together establish EDA/SOPC Joint Laboratory. Altera' Senior Vice President worldwide sales, George Papa, Vice President, Erhaan Shaikh, Taiwan District Sales Manager, Matthew Wu, Terasic Technologies' CEO, Sean Peng, and Soo-Chang Pei, the dean of the College of Electrical Engineering and Computer Science, National Taiwan University, Ruey-Beei Wu, Chairperson, the department of Electrical Engineering, National Taiwan University, all join agreement signing ceremony at National Taiwan University, Taipei, Taiwan. National Taiwan Universities' experienced professors combine with NTU-Altera Joint Lab establishment, the most advanced software/hardware equipments and ready-to-teach tutorials and lab exercises provided by Altera will enhance EDA/SOPC technology education and fully support talent development of EDA/SOPC technology expertise at National Taiwan University. 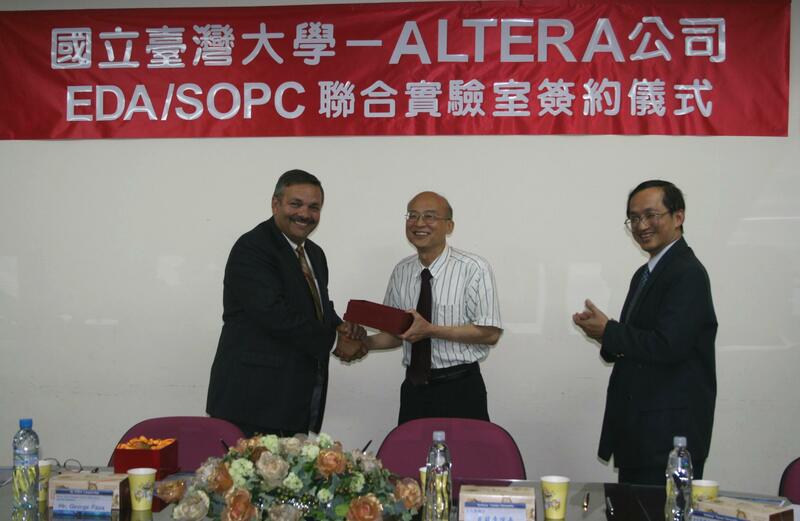 Altera will donate advanced FPGA boards, up to 50 packs of Quartus® II, Nios® II and many valued MegaCores, which are all available for professors and students at National Taiwan University. The total donation value is around US$ 3Million. Terasic Technologies will provide support and advice on software and hardware to NTU’s professors and students. George Papa, Altera' senior vice president worldwide sales, said,“National Taiwan University has made great contributions on academia, industries and society. The professors' outstanding achievements have been recognized by the world's leading professional associations. There are around 360 academic papers published on IEEE and SCI, 18 IEEE Fellows and 1 ACM Fellow from the College of Electrical Engineering and Computer Science, National Taiwan University. Thomson Scientific, part of The Thomson Corporation, honored 5 NTU alumni with Thomson Citation Laureate Award last November. Moreover, many NTU alumni have created world-class enterprises in the technology industry. Therefore, we are very happy to establish Altera Joint Lab with National Taiwan University and to support its SOC research and development. We believe that the NTU-Altera Joint Lab will promote and further improve SoC teaching and research among Taiwan's universities. The department of Electrical Engineering, National Taiwan University has devoted to develop leaders with great vision and insight in the fields of Electrical Engineering and Computer Science. They periodically update equipments at laboratories. In order to develop NTU students' analytic and innovative abilities, they actively collaborate with international leading companies to establish laboratories together. They are grateful to Altera for its software and hardware donations. In addition to expanding equipments at their logic circuits laboratories, they will further apply them for innovative SOPC research and development. NTU expects to further utilize Altera’s cutting-edge technology to contribute to electric and communication technology improvement and to increase its superior talents. They anticipate these talents will bring up new thoughts in ICT industries. Altera Corporation, the world's pioneer in system-on-a-programmable chip (SOPC) solutions, provides high-value programmable solutions including FPGA, CPLD and structured ASIC to approximately 14,000 customers worldwide. Altera University Program is aim to assist professors and students in successfully applying Altera's FPGAs and CPLDs and in providing the best teaching experiences. Terasic Technologies is the leading provider in high-performance hardware and software solutions for FPGA/ASIC prototyping, multimedia and image processing markets. Terasic has created many FPGA boards for Altera including Altera DE2, DE1, Cyclone® II Starter Kit, and the new Cyclone® III FPGA Starter Kit. Terasic, Altera's ACAP design service and training partner, also assists universities in Taiwan in organizing and establishing Altera Joint Labs, and provides technical support to professors and students.